Growing up surrounded by poverty has inspired Kai Daniel to fight for the underdog. The former Otago Daily Times Class Act recipient moved to Dunedin from South Africa at 14 and now runs a bag and apparel business that is part social enterprise. Back in South Africa, shanty towns without electricity or running water were commonplace and homeless people at intersections asked for food and money, he says. "There is a real divide between the haves and have nots and it’s impossible to offer help to everyone so this extreme poverty becomes and is the norm ..."
"Being exposed to [this] growing up in South Africa and being fortunate enough to live in a country as great as New Zealand definitely contributed to the idea of being able to help others who don’t have the resources or the opportunities we have here in New Zealand." Daniel and his business partner say, like many millenials, they feel uneasy about growing inequality. Their aim is to create a world where making products that benefit people and the planet "is the expectation, not the exception". "Fast fashion" is the world’s second biggest polluter and results in millions of people working in unsafe environments, often for little to no money, they add. "We wanted to change this." Duffle & Co provides jobs for more than 20 craft workers in developing countries and gives a percentage of profits to social and environmental projects. In New Zealand, the company teams up with food rescue organisation KiwiHarvest to feed families in need. Here and overseas, it supports local initiatives, such as planting trees and restoring waterways. Daniel had left King’s High School and was playing rugby on a gap year in England when he met Wellington man and company co-founder Danny Pritchard. The pair flatted together while at the University of Otago, where Daniel was doing a double degree in psychology and commerce. 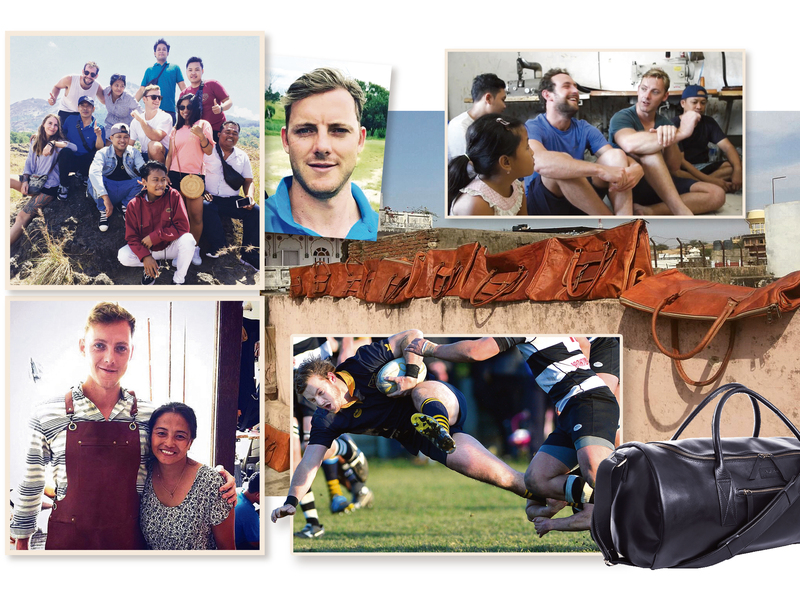 In 2015, while travelling in India, Pritchard met a family who were making leather satchels and duffle bags and trying to compete against large factories. Convinced he could help, he called his friend, who was by then working in corporate banking in Auckland. Together, they agreed to spend their savings on buying 100 bags hand-made by the workers. "The money came from the little savings we had; Danny from a lecturing business, and myself from working as a banking graduate," Daniel recalls. "The rest was made up of a personal overdraft we still had from our uni days and I think Danny’s girlfriend at the time also helped us until we were able to pay her back a few months later." At first, bags were stored under Pritchard’s bed, then in a laundry and a garage. They photographed the products themselves on the deck of their flat, using a bed sheet as the backdrop. When orders arrived, they would fill them by driving to the local post office. It was, they joke, the "worst distribution system in the world". Soon, though, sales were going well and the company had expanded to other regions. Always on the look out for more sustainable materials, they began to use bamboo, organic cotton and pineapple leaf fibres. Their suppliers live in India, Indonesia,Vietnam, Peru and South Africa but the company has its headquarters in Wellington. The 12-strong workforce includes volunteers and paid employees. Daniel, who officially left his banking job last year, is responsible for finance and strategy. He also identifies, and helps upskill, suppliers. For two years, he has lived out of a suitcase while travelling between New Zealand, Asia and Africa. The job leaves little time for other interests for a once rugby-mad teenager, who credits his passion for sport with helping him to make new friends after emigrating to New Zealand. When awarded Class Act in 2008, he captained the Otago under-17 cricket team and was a member of the Junior Highlanders rugby squad. "I never really returned to the cricket field after school ... but played club rugby in England, Dunedin and Auckland," the 27-year-old explains, adding that one day he would like to return to Kettle Park, home of the Dunedin Rugby Football Club, with whom he won a premier championship. "Rugby at ‘Shark Park’ was probably the highlight of my sporting career; not so much the trophies and banners but meeting and being able to interact with such an awesome group of people on and off the field." For now, though, his focus is on work and making a difference. "We provide jobs for more than 20 craftsmen, helping them to support their families and to send their children to school to get an education. We’ve provided more than 3500 meals to those in need here in New Zealand and have planted and paid for the nurturing of 300 native New Zealand trees and over 1000 trees globally," he says, adding 50 additional trees are being funded daily. "But this is just the start, with a big impact front-of-mind for the future."